Blizzard Battle.net Mobile App Now Available! If you've ever wanted to see what games your friends are playing while you’re headed home on the bus, or quickly add a new friend you've met out on the town, now you can with the Blizzard Battle.net mobile app. 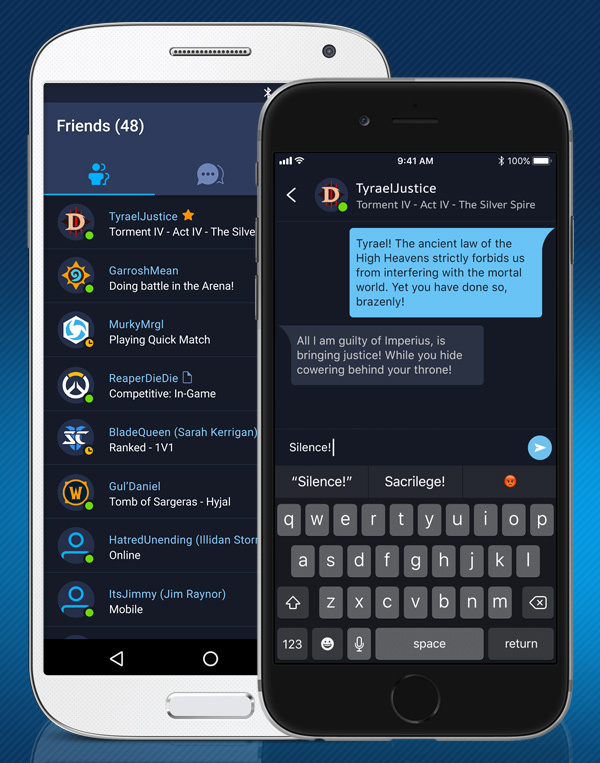 Available for iOS and Android, the Blizzard Battle.net mobile app brings social features from the Blizzard Battle.net desktop app to your phone. The Blizzard Battle.net mobile app is starting to roll out now globally on the App Store and Google Play Store—head over now to download, and check back shortly if it’s not available in your region. The Blizzard Battle.net mobile app makes it more convenient to keep in touch with your Blizzard friends and add new ones. Now it's easier to coordinate play time, discuss strats, or just hang out and chat. When your friends are unavailable, chat history and notifications keep the conversation going. You can see at a glance what your Blizzard friends are up to, so you know when it’s time to jump into a game. Quickly add friends or accept friend requests right from your phone. You can also scan a QR code for easy in-person friending. With the Blizzard Battle.net mobile app, it’s easier than ever to stay connected with your Blizzard friends. Download the app today!